Hematite is a very common mineral consisting of iron oxide. Its color ranges from steel gray to almost black (specular hematite), brown to reddish brown, or red. 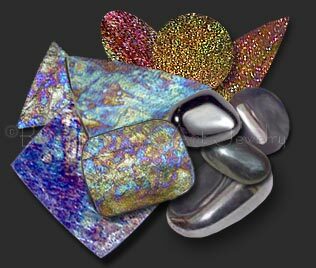 The variety known as rainbow hematite exhibits colors similar to oil patches on water. The drusy form of rainbow hematite is quite fragile and is usually backed with a quartz material to increase the stone's durability. While the forms vary, they all have a rust-red streak. 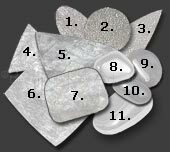 Hematite is harder than pure iron, but it is much more brittle. The name hematite is derived from the Greek word haimatites for blood. It is mined in Australia, Brazil (rainbow variety), England, Mexico, the United States and Canada. It is the state mineral of Alabama, USA where approximately 375 million tons were mined between l840 and 1975. Rainbow hematite is the trade name given foliated specular hematite which comes from a mine near Belo Horizonte, Minas Gerais, Brazil. An important pigment known as "red ochre" it was used in cave paintings and paint pigment. In ancient times it was believed that large deposits of hematite formed on battlegrounds where soldiers were injured and lost blood from their battles. It is thought to reduce stress and enhance one's personal magnetism. It is also thought to increase optimism and courage and helpful in transforming negativity.